I couldn’t hear her at all. The bass thumping through Mood’s, a two-story club in downtown Managua, was a conversation killer for sure. But that was fine for the moment. On the dance floor, about 500 beautiful Nicaraguans moved in perfect time with the DJ. They danced in place for the most part. A few steps forward. A few back, then sideways like clockwork, always returning to the same spot. I was just following their lead. Hips first. Eight count. I smiled back. I loved that compliment, because I love Nicaragua. I love Latin culture. Over the course of a recent ten-day surf trip and every time I’ve visited since the early ’90s, locals have welcomed us into their homes, shared meals with us, even picked us up off the side of the road, towed our broken car into their yards and in the most resourceful and impressive fashion figured out how to fix our wounded vehicle. Just a few days earlier, without any hesitation, a benevolent stranger pried a very necessary wheel from the wagon in his shed, removed its tube, and replaced the limp vinyl tube in our tire. It fit perfectly. He asked for nothing in return. I offered him groceries and a slab of beer. He accepted. We shook hands and wished each other well. This particular evening followed five days of near-perfect surf at Colorado’s, a beachbreak located in Nicaragua’s southern quarter that has grown exceedingly popular among itinerant surfers within the last five years. Rumors of three hundred days of offshore winds combined with a consistent pulse of swell will do that. Since returning to California, I’ve overheard multiple conversations in the lineups about expeditions to this wave. I always listen carefully to hear people’s impressions, and I’m sometimes tempted to join. Usually, I don’t. And this trip, aside from yielding amazing waves and memories with new friends, caused me to consider the impact of surf tourism more broadly. Just a few days before leaving, I attended a lecture where the professor discussed economic strategies of developing countries and how many have chosen to avoid tourism as a principal driver of revenue – primarily because they hope to avoid the cultural degradation that frequently ensues: prostitution, drugs, the homogenization of culture and loss of local language and customs. These are common byproducts when an economic need to appease visitors trumps the rights and interests of locals. This neo-colonial narrative sounded familiar to me. Unfortunately, it reminded me of surfing. We didn’t discuss surf tourism explicitly, but at first glance the portrait of global surf tourism hubs is less than inspiring. To be fair, a variety of factors cause complex problems like those mentioned, and we can’t infer a direct causation between the influx of visiting surfers and cultural degradation in locales like Bali, Hawaii, and Costa Rica. But we can’t ignore the fact that the incidence of prostitution, drugs, crime and the loss of local customs hasn’t decelerated at many world class surf destinations since we started putting boards in bags and expatriating. For instance, according to La Nacion, Costa Rica experienced a 700 percent increase in robberies and a 280 percent increase in drug related crimes between 1990 and 2006. Reports of crystal meth use date back to the 1970s in Hawaii, and the incidence has steepened dramatically as nearly 3,000 Hawaiians sought treatment for meth in 2002 – more than the number of individuals who sought medical attention for alcoholism and marijuana combined. And Indonesia’s Tourism Department recorded more than 13,703 child victims of sexual exploitation between 1972 and 2008. 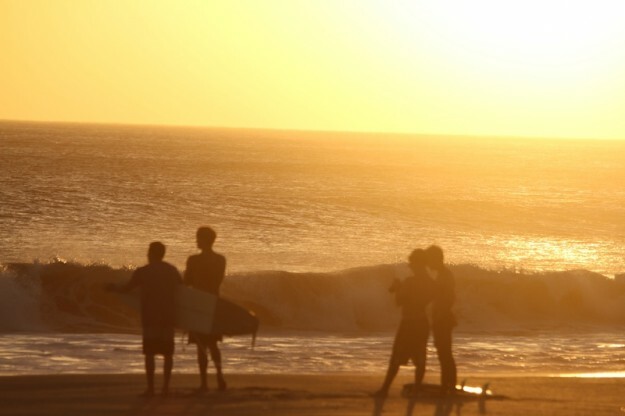 Coincidentally or not, these trends parallel the emergence of surf tourism in each locale. I hope for visiting surfers to leave an additive legacy, and I’m afraid that the micro-economies that the surf tourism industry leaves behind as breadcrumbs (vocations like ding repair, personal surf photos, rentals) aren’t sufficient. For surf tourism to really give back, locals should reap a more equitable slice of the pie. They should administer surf tourism on their terms. Granted, (at its best) surf tourism yields a positive economic impact and creates jobs for locals, but what about its worst? Is it okay that you don’t need to speak Spanish in Costa Rica? Is the proliferation of prostitution in Bali acceptable? Hawaii’s relationship with California is understandably tense in the surf world. In many ways it reflects the cultures’ acrimonious beginnings very accurately. Consequently, I’d like to encourage the intentions of organizations like SurfAid International and Surf Resource Network (which focuses on creating sustainable change in the communities we visit) as they understand the importance of lightening surfing’s global footprint. Surfers have a unique opportunity to embrace global citizenship in a way that exceeds most enthusiast communities. We interact with remote, often impoverished locales in very intimate ways. And I’m not so sure that global citizenship arrives in the form of official programs. Sometimes the pseudo-economic justification becomes an excuse for a trail of drugs, prostitution, and crime. I also think kindness can be impactful. The next time I visit my friends in Nicaragua, the poorest country in Latin America (which also happens to be the safest in Latin America – incongruous statistics that speak directly to the character of the country), I don’t want to speak English. I don’t want to see the ugly trappings of (surf) tourism colonizing its beautiful people. I want to see the influx of surfers adding to Nicaraguan culture. I want to protect and celebrate that sangre latino and its various incarnations worldwide. Through mindful travel, we can do that. Bonus: Latin soundtrack available here.